At CES 2019, Razer made multiple product announcements, including multiple “firsts” for them as a company. There’s a handful of them, so let’s dive right in. As of today, the Razer Turret, the first wireless keyboard and mouse solution for the Xbox One, is now available for sale. The Razer Turret features Razer Chroma lighting, including lighting feedback for supported games. The Razer Turret is designed to rest on your lap and uses magnetic sides on the slide-out mouse surface to help keep the mouse from falling off the sides. The keyboard also houses a dedicated Xbox button for accessing the Xbox panel and its features. “Paradox, Surviving Mars, Sims, Minecraft, Deep Rock Glactic, Children of Morta, Moonlighter, Minion Masters, Day Z, Vigor, Wargroove, Vermintide 2 (incl. Chroma support), War Thunder, Strange Brigade, Warface, Bomber Crew, X-Morph-Defence (incl. Chroma support), PUBG, Warframe, Roblox, Fortnite, SoT and Rainbox Six Seige. “ – from Razer Press Media Alert. You can check out or purchase the Razer Turret for $249.99 at Razer.com here or at Microsoft’s store here. Razer’s popular Razer Blade 15 is now offered with increased graphics performance option, the NVIDIA® GeForce RTX™ 20-series GPU. The demo at CES 2019 used Battlefield V to showcase this new GPU option’s power with real-time ray tracing and AI. Character reflections on cars, windows and shiny surfaces as well as area and light reflections against icy floors displayed beautifully and without lag. In these advanced models, this new GPU inclusion is reinforced by the latest 8th generation Intel® Core™ i7-8750H 6 core processor, 16GB of DDR4-2667 MHz dual-channel system memory and up to 512 GB of PCIe SSD storage. The Razer Blade 15 Advanced Models continue many the staples Razer established with their 15.6-inch laptop. The new models will continue sporting an aluminum chassis with a thinness of 0.7 inches, vapor chamber cooling, Dolby Atmos ready stereo speakers, and a 15.6-inch Full HD panel with refresh rates of 144Hz. However, new to the Razer Blade 15 Advanced Models is the inclusion of a new Windows Hello IR camera, allowing for user authentication using facial recognition. There will also be Mercury White editions of these new advanced models which will be available exclusively at Razer.com and Best Buy. You can check out more of the new Razer Blade 15 on Razer.com here. 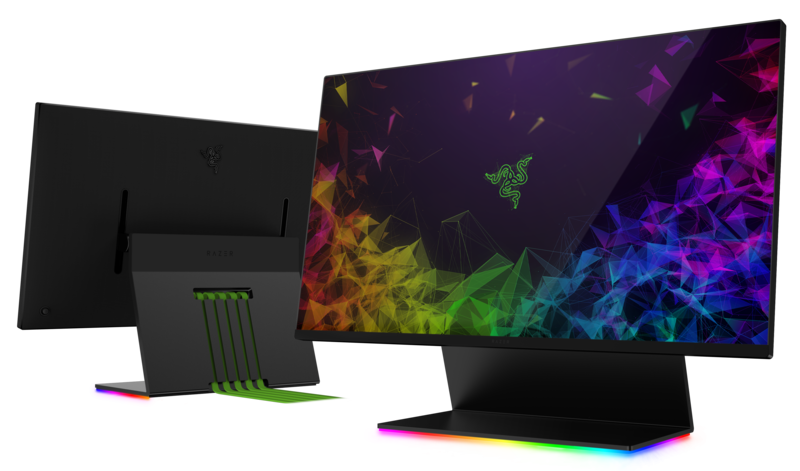 The Razer Raptor is a 27-inch monitor and is the first display product directly by Razer, outside out partnerships. The Razer Raptor’s display features AMD Radeon™ FreeSync™ technology on a custom-calibrated WQHD (2560×1440) IPS edge-to-edge panel. The monitor gives you a refresh rate of 144Hz and shows off 95% of the DCI-P3 color gamut. The monitor achieves various response rates, where it typically sits at 7ms, can reach 4ms with Overdrive, and 1ms with Motion Blur reduction. The display can reach a brightness of 420 nits and maintains a 178-degree viewing angle. As for the body of the Razer Raptor, you have 2.3mm bezels, an aluminum base, and a fabric finish on the back, complete with Razer logo-ing. The monitor’s stand allows the display to tilt as far as 90 degrees, allowing for easy access to the monitor’s ports: HDMI, DisplayPort, USB-C, and two USB 3.0 pass-throughs. The USB-C port doubles as a power source for low-wattage devices while it acts as display option. To complete the package, the Razer Raptor includes flat cabling for all the monitor’s aforementioned ports, leaving you with just the simple task of connecting the display to your PC tower. The Razer Raptor sports strong display specs in within a stylish body. The base houses CNC milled channels to provide low-profile and sleek cable management for the included cables to your PC. Not to mention, you have customizable Razer Chroma lighting at the base of the Razer Raptor, completing its profile as the latest addition to the Razer peripheral family. The Razer Raptor gaming monitor is headed towards the US and Canada this year for $699.99. You can check out more of the new Razer Raptor on Razer.com here. The Designed by Razer Case program was started in 2014, geared towards providing an avenue for 3rd-party production and sale of Razer designed and branded PC towers and cases. There have been several products resulting from the program, such as the MAINGEAR R1 | RAZER Edition PC Tower we saw back in 2016, which was later followed by its successor, the MAINGEAR R2. This time around, Razer brought two mid-tower chassis to the CES 2019 show floor, each developed in-house. The Razer Tomahawk utilizes a minimalist design, being able to support ATX motherboards without sacrificing features, despite being of a mid-tower size. 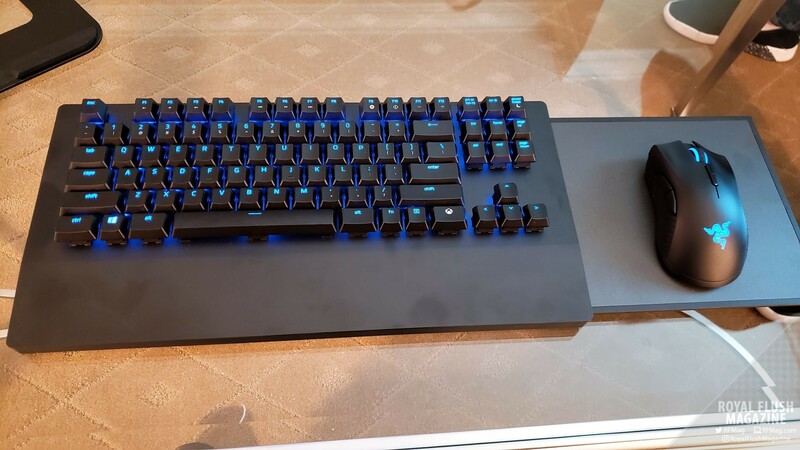 The left side of the chassis features a transparent glass, a perforated top panel for air flow, and the sides along the bottom of the chassis feature customizable Razer Chroma lighting. The Razer Tomahawk Elite takes this mid-tower design to the next level, featuring tempered glass for the top and sides of the chassis and a matte black aluminum front panel. The side panels swing open like the doors on a DeLorean, utilizing arms that hold the sides upright, allowing for easy access inside the tower. The top panel uses hydraulics to automatically lift up during rigorous PC processing, allowing air to exhaust out of the top as well. The Razer Tomahawk Elite also comes prepared for various liquid cooling solutions. The Razer Tomahawk and Razer Tomahawk Elite are still being finalized, with pricing not yet available and targeted availability between Q2 and Q3 in 2019.